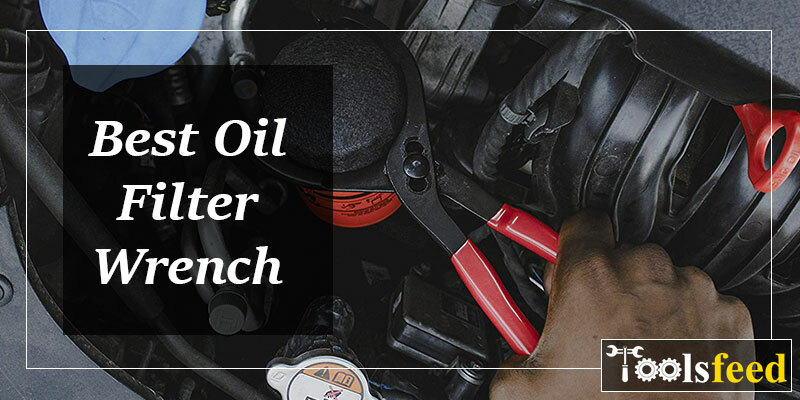 Best Oil Filter Wrench for 2019 : Remove Stuck Filters Now! The abrasive ingredients of the engine oil can clog the filter if you don’t change the oil over regular use. It causes dirty oil circulation inside the engine which reduces the flow of oil. But this problem can be avoided by replacing the oil filter. Therefore, almost all vehicles have a specific duration for oil filter replacement. But all the filters don’t have the same size and cap can be too tightened to lose with regular tools. To overcome this difficulty, there are now plenty of filter wrenches in the market. We made the finding easy by narrowing the list of best oil filter wrench in just 10 through which you can have a satisfactory oil filter removal. Offering greater fitting, this best Toyota oil filter wrench comes with incredibly high performing quality. Without the slightest cheap imitations, you can have the professional removal with this equipment from Motivx Tools. Extremely tight filter caps cause enormous pressure over the wrench. But these wrenches are simulated into the shape at high pressure that makes it durable. Also, it imparts great strength to withstand the heavy pressure from the filter cap. Through 6061 T5 aluminum construction, this wrench promises quality. Though casting aluminum is less expensive, forging provides a better result. Therefore, you won’t experience any cracking or failure. The anodized finishing provides greater protection against weather action. If you want something sturdy that fits Toyota or Lexus, you can rely on this unit which can last for the vehicle life. High-quality 6061 T5 type aluminum forged construction. Greater strength and durability due to high-pressure forging. Engages both tops and below tabs for the oil filter housing. Anodized black finishing induces beauty and easy cleaning. Suits Toyota, Lexus, Scion with 2.5L up to 5.7L engines. Not suitable for filters having disposable spinning style. This wrench can’t work with conventional canister filters. With a 2-piece set, this versatile unit is able to manage several items with ease. A proper combination of the strap along with handle makes the removal quite comfortable for this wrench set from Craftsman. Speaking of the straps, they are of reinforced rubber that is 16” in length. Thus, the rubber is strong and long enough to do the removal. Though they are not as strong as the metals, yet provides excellent pressure to make it work. There come 2 different wrenches with the pack. Using the larger one, you can take care of things having a diameter up to 6 – 3/8”. In the meantime, the smaller one is able to manage items having 4” diameter at most. Apart from that, the handle is of cushioned plastic. You won’t face any difficulty in holding and pressing the wrenches. For lightweight household plumbing application, this best universal oil filter wrench offers innumerable flexibility. 2 different wrenching devices enable wider applications. Easy removal operation through 16” long straps. Comfortable handling along with cushioned plastic. Reinforced and rubberized straps impart great strength. Secure gripping and turning reduce possible slipping. The wrenches may not hold good for heavy tight caps. Strap quality is quite inferior to the original ones. Reaching cramp or hard spaces within the engine, these pliers-type wrench offers superior versatility. Again, longer handles and secure gripping of this Bastex creation deliver a perfect removal of oil filters. Having sturdy steel construction, this wrench is designed to perform when you need it. In fact, each set comes with increased serviceability and strength when to last through the toughest tasks. Providing 3 different adjustment positions, it induces professional quality. Not to mention, you can adjust the length, jaw, and joint. Adjustment for 12 inches in length, 1.5 inches of the jaw and 0.5 inches of joint thickness offers better performance. The soft padded grips are of rubber gel that triggers comfortable handling. Without the slightest slipping possibilities, this plier would be the best oil filter wrench in the market to work with. High-quality steel construction for increased serviceability. 7 adjustment facilities to achieve desired length and tension. Undercut tongue with grooves prevents pliers slipping. LASER treated jaws induce precise and accurate gripping. Padded grips of rubber gel offer comfortable handling. A number of jaws may seem insufficient for heavy pressing. Only suitable for specific oil filters of 4 – 3/8” diameter. Another pliers-type wrench from our top picks is this ergonomic unit. Similar to the previous one, this best oil filter wrench from TEKTON are designed to reach tight places of the engine. Through commercial steel construction, you will have durability and strength at the same time. The steel is sturdy enough to handle the high pressure of oil filter caps and allows you to do the task in a more efficient way. A quick adjustment of the wrench size is quite important regarding proper disposal. And there comes a 3-position slip joint facility to make this adjustment. Thus, you can easily fit the jaws with the oil filters. Longer handles and comfortable grips induce a better non-slipping control for this wrench. These versatile best oil filter pliers are capable of meeting your demand for a quick and easy removal if oil filters. Heavy-duty and durable construction along with sturdy steel. Joint design includes a 3-position adjustment for faster fitting. Right-angled teeth at jaw allow accurate and precise gripping. Non-slippery operation with soft padded and comforting grips. Long handles of 12” offers greater reaching range for the user. Fits only oil filters of 4.5-inches diameter or lower. The wrench works over metal filters only. Suitable fitting along with great finishing makes this unit a perfect option for smaller oil filters. In fact, this product of Lisle provides a pretty good result for imported and domestic cars. Through a unique circular shape, it offers easy removal for the desired filter. Though there exists no specified handle, you won’t require any further tools. Not to mention, the 3/8” driver allows the user to apply the pressure without any grips. You can remove the filters having a diameter of 2.5 inches up to 3 – 1/8 inches. This range is not very effective for numerous modern vehicles, yet is capable of delivering satisfactory disposal for the designed ones. Without the slightest slipping, the steel jaws can take out the filter. When you want something different from the typical ones, this unit would be a pretty good choice. Unique circular shape provides ease of operation. Steel jaw is able to pick the oil filter from the top. Capable of reaching tight places through 3/8” driver. Exterior finishing induces better protection. Clockwise crank allows 4” extension for the tool. Only filter removal is possible, no tightening. Not suitable for cartridge filters. This 9-inch plier wrench combines superior strength with reliability to remove the stubborn oil filters from the vehicles. You can fulfill the demand of larger PVC or oil filters with this Channellock product for sure. To ensure the best serviceability, this best oil filter wrench comes with a high carbon steel construction. It delivers greater durability to serve your car. Also, the C1080 steel is able to handle the tough pressure. With a jaw capacity of 1.75” up to 3.5”, it fits mostly the typical cars along with small engines. The best part is you can use this for ATV, garden and lawn maintenance apart from cars or motorcycles. The completion arrives with the iconic blue handle that contains comfortable padding. Though it is not for heavy usage, it can provide a perfect service for compatible engines. Superior durability with high carbon steel construction. Right angles teeth offer better and accurate gripping. Comfortable blue handle with padding is easy to spot. A wider range of jaw capacity from 1.75” up to 3.5”. Electronic coating over the steel for weather protection. Smaller sized pliers are not suitable for heavy vehicles. Only 4 adjustments are possible to make fittings. Along with an innovat​ive design, this unit is quite unique that induces versatility. This wrench from INNOVANT combines all the facilities you need to remove the tightest filters. This claw type wrench includes 3 different geared prongs of metal. Also, they accommodate ratchet driver to combine the prongs. All the prongs provide a perfect jaw to grip and turn the filter. Being adjustable, the jaws offer a quick fitting for the filter caps. In fact, it allows them to grip caps of diameter 2-1/8” up to 4-1/2”. Thus, it suits common vehicle engines without requiring much time for fitting. Delivering a confined space, this is indeed the best oil filter wrench for tight spaces. This unique claw type wrench is able to give perfect removal as well as tightening service through its incredible design. Optimum serviceability along with stainless steel frame. Suitable for both removal and tightening the oil filters. Adjustable metal prongs offer fast fitting and better gripping. Larger nitrile rubber gloves allow easy and safe operation. Includes ½” up to 3/8” of socket adapter for smooth contact. The prongs may seem to be quite thick for certain filters. Unable to reach tight and narrow spaces of the engines. This is another peculiar claw type wrench that comes with versatility and ergonomics. Not to mention, this Craftsman creation is designed to handle the heavy duty and stubborn oil filters with ease. The high-quality steel construction allows the wrench to last much longer. It not only imparts superior strength but also encourages greater serviceability. Thus, it can withstand high pressure while turning the filter. The most unique feature about this product is the automatic adjustment or tightening. When the torque is applied, it launches the automated adjustment. It allows a better gripping for the caps to induce a fast removal. Again, the exterior black oxide finishing protects the interior steel from moisture action. Therefore, you can check this unique and perfect tool to get your job done with optimum comfort. Heavy-duty steel construction to handle oil filters. Automated tightening enhances better performance. Precise as well as accurate gripping for the filter cap. Oxide black finishing offers weather resistance. Compatible with both 3/8” or ¾” rachets for turning. No soft tips or handle is available for the wrench. Removal is quite difficult for certain filters. Being suitable for typical filters, this swiveling wrench offers incredible versatility. Having tough and strong construction, this unit from Lisle comes with superb gripping power. With commercial grade stainless steel, it comes with durability and strength at the same time. The steel is sturdy enough to handle the heavy pressure of the filter caps which allows you to do the removal in a perfect way. The oil filter fitting range is 3.5” up to 3.875” (88.9mm to 98.4mm). Needless to say, this is quite common for typical vehicles. In fact, it is designed to fit the most common 3.625” sized standard filters. The overall combination induces a great opportunity to remove the tightened filter at once. You can reach narrow spaces and grab with accuracy through this best swivel oil filter wrench for sure. Efficient swivelling band design encourages precision. Tough stainless steel construction imparts durability. Highly suitable for standard filters of 3.625” diameter. The permanent textured coating offers better gripping. Easy to reach and grab the caps from tight spaces. Without the fixed handle, the reach is quite small. Slipping may take place due to oily jaws. This best oil filter wrench set comes with the same swiveling design like the previous wrench. The most noticeable difference lies with the 4 bands of different sizes that offer greater removal efficiency for this OEMTOOLS creation. Having high-quality stainless steel, all the 4 bands come with superior durability and strength. The steel has sufficient sturdiness as well to handle the heavy torque while the filter caps is removed or tightened. Using two detent pins, you can install or remove the bands from the swiveling handle. Not to mention, the package includes one handle against 4 bands. With the pins, the installation or removal gets easy and simple. Also, the modern webb lock facility induces further safety for the bands while using. This is indeed a great purchase that suits heavy vehicles to lightweight mowers to take care of oil filters. 4 different bands suit intense and heavy removal tasks. Stainless steel construction induces strength with durability. Easy installation and removal of the band with detent pins. Secure and accurate gripping through Webb locks facility. Greater range of fitting from 2-3/8 inches to 4-3/8 inches. The bands may not withstand too tight filter caps. All 4 bands are easy to break if the handle is laid flat. It is common to face difficulties when you want to choose the best oil filter wrench for your vehicle. In most cases, the one which suits your truck will not suit your car. Therefore, you should give a try with different wrenches to pick the best fitted one. But to make that easy for you, you need to understand some criteria regarding the best one at first. ​The size of the oil filter is the most important to consider while buying. If the cap is small, you have to choose something light. Again, for medium or large caps, you have to go for heavy wrenches. ​If the surrounding room is quite low, then you may face trouble with the removal. In this case, socket or spider wrenches would be a perfect choice. Otherwise, you can use pliers or band ones for your engine. The tightness of the cap is also important as removal of highly tight cap puts extreme pressure on the jaw. You have to ensure the sturdiness of the jaw and handle to loosen or tighten the connection. ​Without proper fitting, you won’t be able to grip with precision. This will lead to a stressful operation while working. To enable quick fitting, you can go for adjustable jaw-type wrenches which will help you in these cases. ​To have the best serviceability and sufficient durability, construction material is quite important. Though most of the wrenches are of steel, you can choose aluminum or reinforced rubber which have great strength. There are several oil filter removers available in different styles and models. But strictly speaking, there exist 4 basic types of wrench. Each of these types has certain applications and compatibility. ​They have numerous sizes along with recessed oil filter shape. These are suitable only for specified filters. For too tight connection, they are just good for spinning. Also, wrong handling can easily put an end of the frame. ​It generally comes in 3 jaws universal style. They tighten the bottom which gets tighter with every turn. They require little rooms to work on and offers several adjustments to grip the cap. ​These types particularly come with swiveling handle with bands. It is preferable when the cap is not welded. It is quite simple to use which requires slipping over the filters and turning only. Unlike the fencing pliers these are considered to be the most useful to fit with numerous oil filters. Though they can leave smaller dents and literally tear a hole on the filter side, having a swiveling one would reduce this problem. As mentioned earlier, you can’t rely on your bare hands to make a proper change of oil. In fact, loosening or tightening is quite difficult to do without wrenches. Also, there are some benefits that make these wrenches this much convenient to use. If you know the guide of using oil filter wrench, then you will get the best result. Very simple and easy to use when you have to run against time. It ensures the full-service provider for the car engine after the oil change. They ease the loosing or tightening caps of slippery or oily filters. New filters remain safe while making the change or removal. Small in size and therefore, requires almost no effort to do the change. It protects the filter exterior from catching leakage or failure cracks. If you are going through a hard time selecting the best oil filter wrench for your engine, you should scroll our products. Each of the aforementioned 10 is capable of removing their compatible caps. Though giving a try with several others will help you to attain a better result, you can rely on our analysis. We can guarantee that the selected one from our list will accurately accomplish all your demands for sure.